Cooking and baking can be messy, and when you’re mid-recipe you don’t always have the time to rinse off. Though there might not be any use crying over spilled milk, why risk it? All of the TPQ Life stainless steel measuring cups and spoons are crafted with silicone handles to give you maximum comfort and control, so your cooking experiences are nothing but delicious. 1 Collapsible Silicone Funnel as a special gift! After the thrill of creating a culinary masterpiece, the last thing you want to worry about is cleanup. That’s why our kitchen accessories are incredibly easy to clean. Our measurement cups and spoons are made from dishwasher-safe stainless steel, so you’re only one wash cycle away from spotless gadgets! And storing them is also easy with the included silver rings that allow for convenient stacking. Our top priority at TPQ Life is your satisfaction. From your shopping experience to the product itself, we pride ourselves on our commitment to excellence. If you receive a product that falls short of your expectations, let us know! We’ll do whatever we can to make it right. Add TPQ Life into your culinary arsenal and make cooking fun, exciting, and oh so tasty! Are you going to make your favorite chocolate cake, but don’t have a proper way of taking the right quantities mentioned in the recipe? Or, looking for a perfect measuring cups and spoons set that you can rely on? No more guesswork in the kitchen! 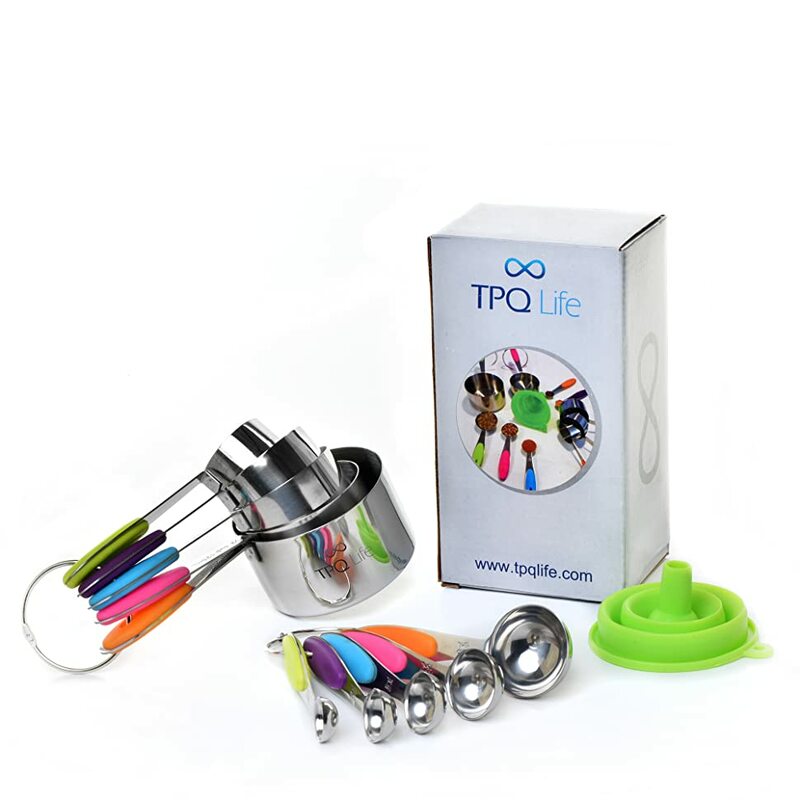 Try our amazing collection - TPQLIFE 10 Piece Measuring Cups and Spoons Set and ensure that you have added the right quantities for a delicious result! The package contains five types of spoons (1, ½ tablespoons and 1, ½, ¼ teaspoons) and five different sizes of cups (1, ½, ⅓, ¼, ⅛) which you need for everyday food prep tasks. Perfect for both pro chefs and newbie! These high-quality measuring cups and spoons are crafted from polished stainless steel and never get rust, melt, bend, warp or break as cheap utensils out there. This measuring set will make your cooking tasks easier while being gentle on your cookware. The engraved markings in both US and metric measurements with color coded handles, you’ll never have to worry about incorrect measurements. Great for both dry and wet ingredients and ideal for weight watching, diet monitoring, and portion control. These expertly crafted cooking and the baking set features colorful silicone handles which give you the perfect balance of comfort and control. Everything is easy to clean, dishwasher safe and have 2 separate silver rings for easy storage eliminating the need for an additional utensil holder. No more headaches on pouring liquids. Our silicone funnel makes your life easy by avoiding messy spills. It can withstand up to 230 0C, highly resistant to stain, dishwasher safe and collapsible for easy storage.